There were more 24-year-olds in the U.S. than people of any other age in 2015. 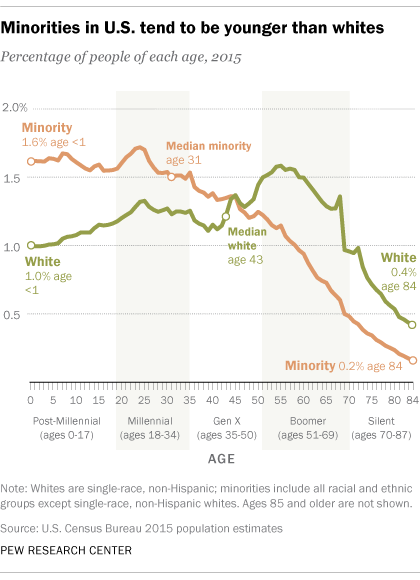 But for white Americans, 55 was the most common age, according to Census Bureau data. In the histogram above, which shows the total number of individuals of each age last year, non-Hispanic whites tend to skew toward the older end of the spectrum (more to the right), while minority groups skew younger (more to the left). One reason that non-Hispanic whites are disproportionately older than Americans overall is that they were the biggest population gainers from the post-World War II baby boom – an era before many of today’s minority immigrants entered the country. 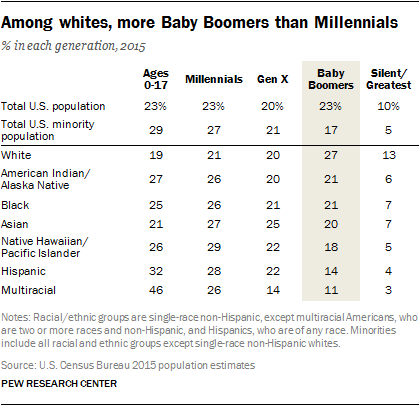 Whites were the only racial or ethnic group in which Baby Boomers (27% of whites) outnumbered Millennials (21%) in 2015. Non-Hispanic whites, who constituted a majority (61.6%) of the U.S. population in 2015, had a median age of 43 — meaning that if you lined up all whites in the U.S. from youngest to oldest, the person in the middle would be 43 years old. This compares with a median age of just 31 for minorities, and 37 for the U.S. population overall. More than half (56%) of minorities in 2015 were Millennials or younger. While minorities (who include everyone except single-race non-Hispanic whites) made up just 38.4% of the U.S. population last year, that figure is up slightly from 38.0% in 2014. The minority population grew at a faster pace (2.0%) than the white population (0.1%) during that time. Minorities’ higher growth rate is expected to continue, and the minority population will likely surpass whites in the next several decades. Today, Americans under the age of 5 are already “majority minority,” though by only a small margin. Americans with two or more races were the youngest group in the Census Bureau data, with a median age of 19. There were a higher number of multiracial Americans under the age of 1 in 2015 than there were of any other age. Nearly half (46%) of multiracial Americans were ages 0 to 17, which means that they were not yet part of any named U.S. generation. U.S. Hispanics were also a notably youthful group. Their median age was 28, and their most common age was 8. As a separate Pew Research Center report noted, Latinos have long been one of the nation’s youngest racial/ethnic groups, dating back to at least 1980. Today, the relative youth of Hispanics is driven by the U.S.-born Latino population, nearly three-quarters of whom were Millennials or younger. Asians grew the fastest among all racial or ethnic groups in 2015. They were also older than most other racial/ethnic groups last year, though not as old as whites. Their median age was 36 years, and their most common age was 33. The highest shares of Asians are Millennials (27%) and Gen Xers (25%). 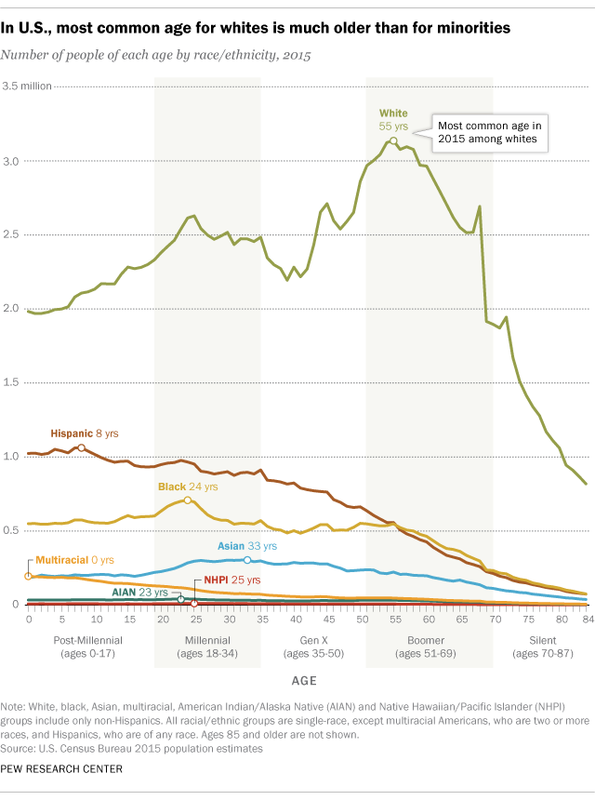 The median age of blacks was 33 last year, while their most common age was 24. About half of blacks were Millennials (26%) or younger (25%), while 21% were Gen Xers and another 21% were Boomers.